Hanuma Vihari, who made his debut in the fourth Test in England, miss out as India could go in with three spinners in Kuldeep Yadav, R Ashwin, and Ravindra Jadeja. In a telling departure from the normal practice, the Indian team announced their 12-member squad for the first Test against West Indies at Rajkot on Wednesday. 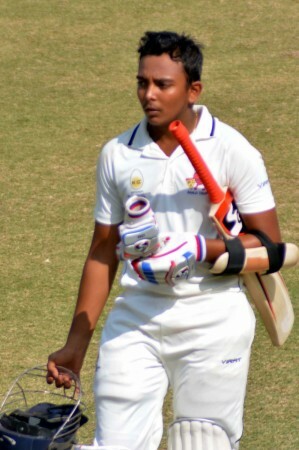 Young Mumbai batsman Prithvi Shaw is all set to make his debut, while Mayank Agarwal and Mohammed Siraj miss out. Also, Hanuma Vihari, who made his debut in the fourth Test in England, miss out as India could go in with three spinners in Kuldeep Yadav, R Ashwin, and Ravindra Jadeja. Mohammad Shami is all set to take the new ball as Umesh Yadav and Shardul Thakur will battle it out for the second pacers squad. "With a couple of new guys coming in at the top of the order, they have the opportunity to show the skill sets they've got and why the selectors have backed them," said Virat Kohli, the India captain, on the eve of the Test. "Everyone wants to play for the country and it's good to see all these guys are not just performing in the IPL [Indian Premier League] but they are taking domestic cricket very seriously," said Kohli. "Someone like Vihari or Prithvi or Mayank, they have been brought in because of what they have done in the domestic circuit, consistently," he further added. Speaking about what Kohli told him in the England tour, Prithvi had said that the captain wanted him to put the interests of the team ahead of him and always focus on being hungry. "Batting ke time, England me swing hota hai. So, the opposition played with a lot of mind. They knew where to bowl and how to bowl to each batsman. I asked Kohli how he managed to score all those runs. He told me that he always puts the team before him. Woh hunger apne aap aa jata hai," Shaw told Indian Express in an interview.